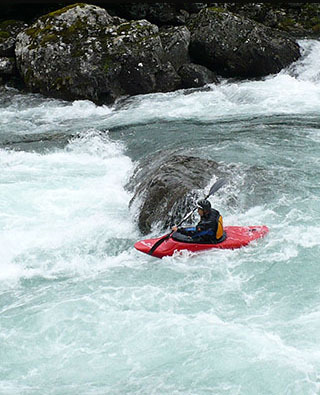 Eidfjord has excellent rivers for white water kayaking, for all levels of difficulty. Adrenalin kick for active people is guaranteed! We offer instruction in river paddling techniques and paddling in white water, grade I – II according to the skills of the group. River sections offering higher levels of difficulty are also accessible in the area. FlatEarth will guide you to these sections, but we are not offering official courses at this level. We are paddling on the river Bjoreio, just a few 100 m. from our company location in Øvre Eidfjord. The meeting point is in front of the FlatEarth shop and we advise you to meet us there approx. 5 -10 minutes in advance. Wetsuits and all necessary safety equipment is provided by FlatEarth Adventures. Use / rental of special equipment for the activity is included in the price, but do bring a towel as well as your swimsuit to wear under the wetsuit.